It’s that time of the season again. The calendar turns the page to the new year, and some quarterbacks start to write the first page of their playoff resume. On wildcard weekend, it’ll be Deshaun Watson, Lamar Jackson, and Mitchell Trubisky who make their playoff debuts. All three of these quarterbacks have different styles of play, but they’ll be fighting for the same goal – a Super Bowl victory. Deshaun Watson came into this season surrounded by uncertainty due to his season-ending ACL injury last year, but he played a full 16 games this season and finished with the 12th-best grade (82.6) out of 39 qualifying quarterbacks in 2018. He led the Texans to a division title and could add to his big-game heroics with a win over the Colts on Saturday. Watson’s successful sophomore season was fueled not by his legs but by his arm. When given a clean pocket, Watson completed 239-of-322 attempts for 2,722 yards, 17 touchdowns and only four interceptions, good for a passer rating of 111.6, ranking seventh in the NFL. But his play from a clean pocket is not his most impressive feat; what is most impressive about Watson is his performance under pressure. 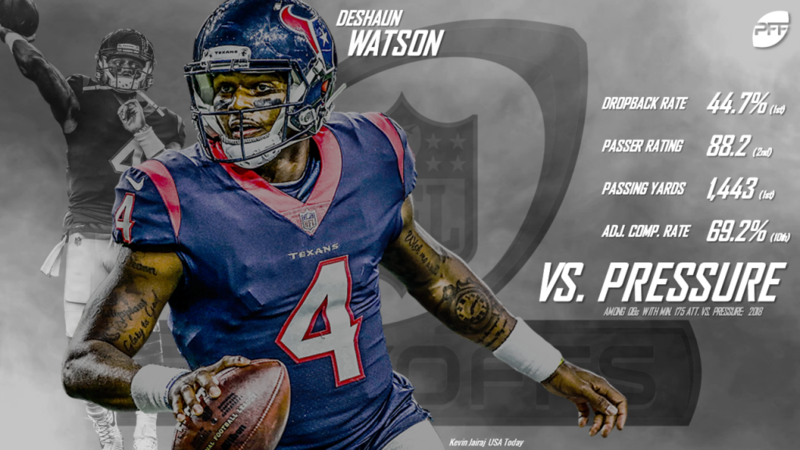 When pressured, Watson completed 106-of-183 attempts for 1,443 yards, nine touchdowns, five interceptions and a passer rating of 88.2, ranking second out of 39 quarterbacks. The fact that Watson had the most pressured dropbacks (281) and was still able to uphold his second-ranked passer rating under pressure is phenomenal. Pressure is something that usually gets into quarterbacks’ heads; the more they see of it, the more they crumble when facing it. Such is not the case for Watson. 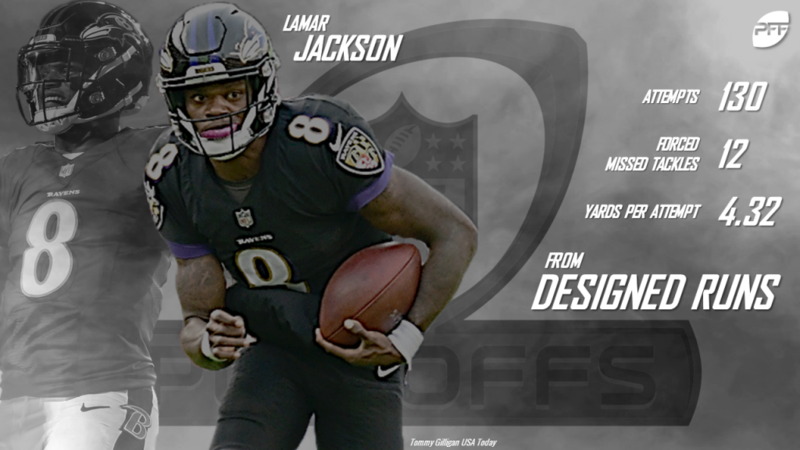 The next quarterback who will make his postseason debut this weekend is Lamar Jackson, who took over the reins in Baltimore in Week 11 and went 6-1 and led the Ravens to an AFC North title. Jackson has been the face of an offense that might look weird to younger football fans. That’s because, in a league where it’s now all about passing the football, the Ravens have run the ball on 61% of their offensive snaps since Jackson took over, which is significantly more than the rest of the NFL. Only the Seahawks have run the ball over 50% of the time since Week 11, and the rest of the NFL has run on 38% of plays. With that said, Jackson hasn’t impressed much with his arm. His big-time throw percentage of 3.4% ranks 32nd among qualifying quarterbacks, meaning he has completed difficult throws at a much lower rate than the average quarterback. Some of that has been by design, as Jackson hasn’t been asked to sling the ball all over the place like the average quarterback is asked to do. Regardless, Jackson’s adjusted completion percentage of 66.7% ranks 38th out of 39 quarterbacks, one spot ahead of fellow rookie Josh Allen. Jackson lacks in the passing game, but he makes up for it with his damage on the ground. Lamar Jackson has 120 rush attempts since taking over as the starter in Week 11, which is more than double the attempts of the next quarterback (Josh Allen, 52). Some of those attempts have come on scrambles, but almost half of them have come on Baltimore’s new bread and butter – the read option. Jackson has carried the ball 59 times on option plays since Week 11; the next closest quarterback is Watson with only 15 attempts. On Jackson’s 59 option attempts since week 11, he has gained 322 yards (5.5 avg) and scored two touchdowns. Jackson’s blinding speed forces defenses to stay home in case he keeps on the option, which helps open up lanes for his running backs when he hands it off. Among running backs with at least 10 attempts on option plays since Week 11, the top two in yards per carry are the Ravens’ very own Kenneth Dixon (7.9) and Gus Edwards (6.4). With Jackson at the helm, Baltimore’s run-heavy offense is going to be a nightmare to stop in a league where everyone is building their teams to stop the pass. In the blistering cold in Chicago, Mitchell Trubisky will be making his playoff debut against Nick Foles and the defending champion Eagles. Back in October, we said that Trubisky must improve if the Bears are going to get serious about the playoffs. Fortunately for Bears’ fans, Chicago’s elite defense was enough to clinch a playoff berth, but Trubisky might need to play better if the Bears want to relive their 1985 season. In his sophomore year, Trubisky has been somewhat of a disappointment, as his overall grade of 63.0 ranks 33rd out of 39 quarterbacks, and his grade has actually decreased from his rookie season when he had an overall grade of 66.4. 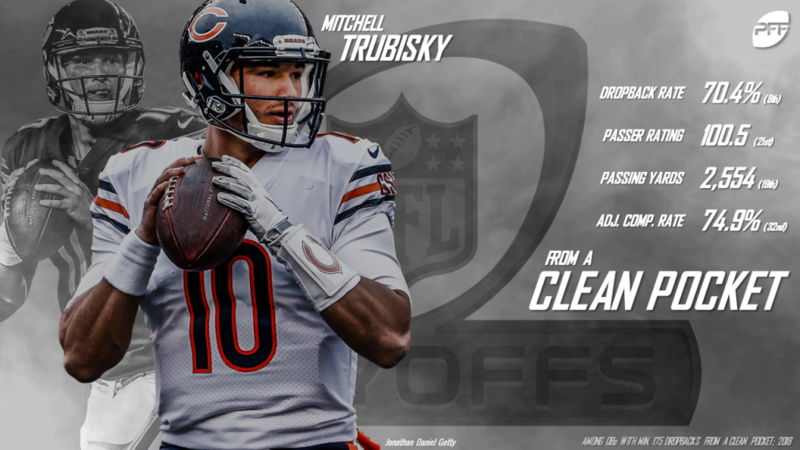 Trubisky’s performance from a clean pocket leaves something to be desired; when kept clean, he completed 240-of-336 attempts for 2,554 yards, 21 touchdowns, 11 interceptions and a passer rating of 100.5, ranking 21st in the NFL. Trubisky’s 11 interceptions from a clean pocket are the most in the league, and his adjusted completion percentage of 74.9 when kept clean ranks 33rd. With the new year comes new hopes and dreams, and these young quarterbacks have a clean slate on which to start their playoff careers. Maybe one of these guys can be the next postseason legend like Nick Foles was last year. Or maybe one of them will be the reason their team loses, and they’ll have to redeem themselves in the future. One thing is for sure, what happens over the next few weeks will set the big-game reputation that will follow these young quarterbacks throughout their career.